Carlos Tavares: Have you been able to conquest Toyota buyers while Toyota has been under a cloud of bad publicity? Not so much. Because of the good work they did in the last decade, the Toyota customer base is very loyal. They get the reward for that. Last year, Nissan Motor Co. changed its American organizational structure, creating a position in the United States to oversee all operations from Canada to Argentina. 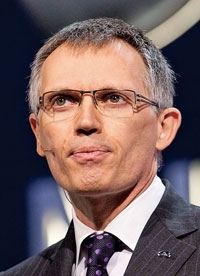 Carlos Tavares, Nissan's former head of global corporate planning and product development, was named chairman of the management committee for the Americas. Tavares, 51, is responsible for sales, manufacturing, product planning, design, finance and strategy for the United States and Canada, as well as Mexico, Central and South America and the Caribbean region. In the United States, the combined market share for the Nissan and Infiniti brands has grown from 7.2 percent in 2008 and 7.4 percent in 2009 to 8.3 percent through the first four months of this year. Tavares, a native of Portugal, operates out of Nissan North America Inc.'s headquarters in Franklin, Tenn. He is also an executive vice president and a member of the board of Nissan's parent company. He met in New York with Editorial Director Peter Brown, Editor Jason Stein and Mid-South Bureau Chief Lindsay Chappell. How is your U.S. business this year? Our growth numbers, year over year, are good. We're going to continue to grow like last year. We are trying to grow steadily and not go overboard on incentives. The big question mark is the total industry volume because it's moving so fast. There is a huge swing in what people are saying about total industry volume. Is Nissan responding to the increase in industry incentives with more incentives? Not more than before -- the same as before. Our incentives are almost flat. Are you picking up sales from the defunct General Motors brands? Yes, certainly. But we try not to be arrogant. When I look at our portfolio, we deserve a better presence in this market. We need to work hard at customer handling. Quality of marketing. Explaining what we stand for as a brand. Being consistent. Delivering what you promise and don't overpromise. What does the Nissan brand stand for in America today? For being different, being fresh, having a strong character expressed in design and innovation and in being fun to drive. But, first, it's important to generate trust. If you don't have trust, you can't try to be different. So the three pillars of our foundation are safety, environment and quality, and we are pushing hard on those issues. On safety, we have a huge number of accolades on crash performance. We need to do a better job of communicating that. On the issue of quality, even though we have huge work to be done, we are moving in the right direction if you look at the improvements we are delivering in Consumer Reports and the number of recommended cars. Of all the cars that can qualify, almost all are recommended except one. Then we have environment. Our weapon there is the Nissan Leaf and zero-emission leadership. That is credibility. How involved have you been in creating the new Renault-Nissan-Daimler partnership? Since I came to the United States in March of last year, I'm not in charge of corporate strategy anymore. I'm using 100 percent of my energy to grow our business in the United States. That's it. That's my job. I give the board my opinion when I go back to Japan for executive meetings or board meetings. But my focus is here, and my head is here. Where could Nissan use some help in the Americas? It's an amazing region. We are going to be the market leader in Mexico, with more than 21 percent market share, and yet I have only a 1 percent market share in a 3 million-unit market called Brazil. In the United States and Canada, I would summarize by saying it's all about doing things right -- on brand, in marketing, in customer handling and those issues. In Mexico we are fighting a very nice fight with Volkswagen and GM. If you go south of Mexico, excluding Brazil and Argentina, we have close to 9 percent market share, working with importers. It's going quite well. Our major issue is Brazil. The reason we are so small there is simply timing. We have been there 10 years; our competitors have been there 30. And 70 percent of the market is so-called popular cars, which are usually fully depreciated products. It's very hard for newcomers because the pricing is so aggressive, and you have to invest something to get started. So we are just ending the first process that I triggered in July 2005, which was to bring in the first four cars to be made in Brazil -- the three cars of the Livina family and the Frontier pickup. I'm adding three more cars from Mexico, because there is a very nice free-trade agreement between Mexico and Brazil. That will be the Versa sedan, Versa hatchback and the Sentra. And then we will add two more next year, and that will give us a portfolio of nine cars. At the same time, we increased the dealer network from 60 to 90 last year, and I'm still short, short, short. Our sales there in March increased 62 percent over last March, and yet I'm still barely holding to just 1 percent. Nissan received a lot of attention by pricing the Leaf at $25,280 after the federal tax credit. You told everyone it would be affordably priced, but there was some doubt about whether you really would. What a surprise: They did what they said! I believe it is very competitively priced. And it could come in at closer to $20,000 in some states, like California, thanks to local incentives on top of the federal ones. It was important for us for the Leaf to be perceived as a real car, and affordability is a part of that. I'm always telling our people: Just say what you will do and deliver it. We don't have to promise the moon -- but deliver what you promise. It's a matter of credibility. And it's important for us, considering how much money and resources we are investing. By getting out front of the market on electric vehicles, you will have an advantage on your second and third generations. Is that why you're moving so quickly? We are moving at what we feel is the appropriate speed just because we want to be the leader. Improving fuel economy is what we do on most of our models. But there is a point at which you need to go from being a small problem to being a solution. With EVs, we will actually change the way we live because of the convenience of having the fuel station in your garage. You won't need to go to the gas station anymore. That's very rational, but won't people still have range anxiety? That will be a step-by-step process. There is some market research by our respected competitor Mini that indicates that after using an electric car, it simply stops being an issue for people. You see that your driving pattern is to go to work and drive home and recharge overnight. Most people are not driving more than 40 or 50 miles a day. You can't always want a car that does everything. We've said often that we don't intend to embrace the full needs of the full customer base with one single car. That's not the point. Did you and your team learn anything from the troubles Toyota has been having over the safety recalls, over its handling of the recalls, and the way the U.S. company relied on safety decisions made in Japan? I would have to say that our organization is structurally different. I think the power balance between our regions is very appropriate. I happen to be a board member and an executive committee member. And that means I'm jumping from the battlefield here to the boardroom every month, which gives me the ability to make decisions I need to make. Another strength Nissan has is diversity. We're used to more diversity at the top of the company: Brits, Americans, Japanese, what have you. That diversity feeds into a willingness to let local people make the decisions they need to make. But still, there is a lesson for us. How can we empower divisional teams to be in a position to make appropriate decisions in a timely manner? And that is something we strive to do.